Please read my answers to the charges. 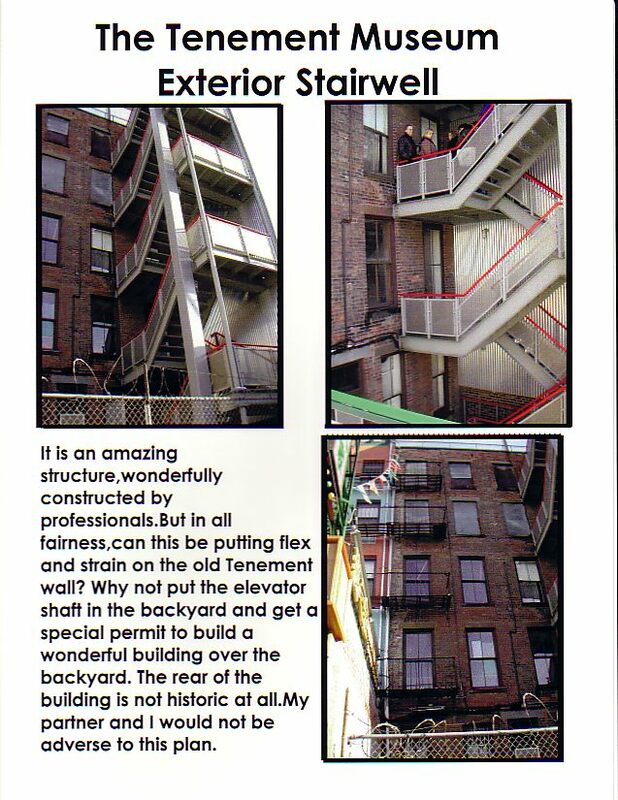 The Lower East Side Tenement Museum is very much relieved by the decision of the Empire State Development Corporation (ESDC) to initiate condemnation proceedings against 99 Orchard Street. Situated adjacent to the Museum's landmark tenement at 97 Orchard Street, the gut renovation of 99 Orchard Street caused a great deal of damage to the fabric of our landmark tenement building, the first homestead of urban, working class and poor immigrant people to be preserved in the United States. Not once have construction / damage problems ever been mentioned in the Empire State Development Corporation (ESDC) report on the EMINENT DOMAIN seizure of 99 Orchard Street. · cracks run throughout the north side of the building, not only the rear facade, but also throughout the interiors of the historically restored apartments. Reply: 6/20/1983 See The Pre Museum condition of our party wall. Not only did the owners of 99 Orchard fail to adhere to any of the regulations regarding building next to an historic site, but they also filed false work plans and were issued numerous violations. Between November 2000 and May 2001, the Department Of Buildings issued at least three stop work orders, which 99 Orchard ignored repeatedly. In addition, the plans filed with the DOB declared 99 Orchard Street's intention to build office and residential space. However, 99's real plan, as is now clear, was to extend a restaurant into the commercial space (which requires stricter safety regulations than the offices they originally claimed to be building). have nothing to do with us. She is disgusting-So many sleepless nights due to this creature..
Just this past November, DOB issued a fourth stop work order after finding that 99 Orchard was doing work that the DOB had not yet reviewed or approved as required by law. The Museum was shocked: If our neighbor's patent disregard of the security of 97 Orchard Street for the education and enjoyment of the public and for the law could result in such damage to this landmark within one year, we were petrified at what would come in the years to come. In the years to come??? We are done building as of July, 2001.Why would anyone believe that we would just keep building and building. The property is only 25ft by 100 ft. We are done. Review the picture of our buildings in 1983, years before the museum. Look at the condition of the lower rear wall and the joining wall of the two buildings , look at the drainpipe and the incredible sagging. Don't let Ruth Abram pass her dilapidated building with its inherent Pre-Museum Condition off on me. I renovated mine and I am proud of it. 6/20/1983 See The Pre Museum condition of our party wall. Wow, the windows and doors don't shut. Hmmmm... Imagine that you're about 10-11 years old, its 1960 and your Grandpa takes you through his junk emporium on the upper floors of his building at 99 Orchard St. Imagine incredible water damage to the upper floors on Allen St. where the roof drain is, from decades of neglect. The windows are slammed shut with thin rolled steel. It's dark, dank, dusty and the smell of pigeon excrement is overwhelming. Now I can tell you that the sagging of our water-damaged, shared wall on Allen St. was a real mess. Those window frames sagged so much it was pathetic. A typical tenement such as ours had a major design flaw , the stairway ran up the middle of the building. As years went on, an incredible sagging from the all sides toward the center of the building would occur. I remember I could put a stickball on the floor and it would roll to the center of the building. 97 Orchard Street was not immune from these environmental and design factors, so door frames fall out of alignment and doors do not close. Ruth Abram's story does not comport with the facts. She sent her reps to the Dept. Of Buildings repeatedly, one might conclude obsessively, to check on our reconstruction process. To this day the cracks and damage she alleges are merely her conjecture with no basis in fact. A reasonable person might wonder why this alleged damage has not been repaired . Could it be that Ruth did not want us to finish. Ruth indicates that the state should take our building, because we are damaging hers. She fails to mention that her own excavating crews ripped the fence down on our parking lot and used it as a staging area , preventing my studio clients from entering the building. When Museum personnel were looking for Tenement Artifacts in the backyard, No one asked permission , they just ripped my chain link fence open and trespassed on my property, and then dug up the yard "DEEP TO THE WALL. AND TO THE SIDEWALK" I was truly concerned for my parking lots retaining wall and the foundation next to mine!! Luckily I was able to save the remains of my cat who had been buried there. I did not call the building dept. when the trespass occurred. In hindsight, perhaps I should have. They don't mention how they had brick work done on the lower width of their building on Allen St. and put a concrete run right up to the wall with no drainage. They dont mention they had a questionable repointing job done on the total rear of the building. They don't mention the monstrosity of a steel stairwell that had beams in front of my building interrupting my client flow and creating a high-volume cacophony of sounds. Again, I did not call the building Dept. We completed reconstruction work in late June of 2001. It is over. Ruth refuses to fix the alleged severe damage. Next, the issue of our not making an office and our plan to make a restaurant. If I want to change my mind about how to allocate space in my building, that is my business NOT RUTH ABRAM's. What nerve claiming that my business partner and I were filing false building plans. My partner and I changed our mind, which we have every right to do. That is what is known as amending building plans, a very common practice. I find it appalling that Ruth arrogantly thinks she has a right to dictate what we do. Apparently she thinks my building and all the buildings on the block are part of her domain. It seems Ms. Abram had an ongoing agenda of filing complaints against us. As a consequence, each time, the D.O.B. sent an inspector. Often, the English speaking foreman was not at the site at that exact moment, so the D. O. B. issued a stop order, leaving a summons. Then, I'd get a frantic call from the office and have to leave a recording session and go to the building. Since the inspector had already left I'd have to go to the Building Dept. Then, typically, we'd wait 2 days for the inspector to return to the site and review things. EACH TIME the return visit CLEARED US of ANY WRONG DOING -everything was fine. This cycle went on and on to the point that it became an annoyance to the inspectors. There are several variations on this scenario I could relate, but suffice to say it was an awful year-and-a-half for me. Wasting my $$$$, wasting your tax $$$$$. Note: Our crew never worked after hours. Sun Sun Construction works from 8:30AM-5:30 Pm and everyone goes home. Chartered by the Board of Regents in l988, the heart of the Lower East Side Tenement Museum is its landmark tenement building, which was home to 7, 000 immigrants from 20 different nations between 1863 and 1935. This humble abode, that housed nearly five generations of immigrant families, is the only remaining example of the type of housing millions knew as their first place of settlement in America and New York City. The stories of the struggles of working immigrants have tremendous meaning today. Our area, which we proudly interpret through a variety of programs, was home to an even greater diversity. In addition to Eastern and Western Europe, immigrants to the Lower East Side have come from Africa, from Asia, and from Latin America. Today, approximately 35 % of the Museum's neighbors are foreign born. Over 90, 000 visitors, representing all 50 states and 33 countries, came to the Museum last year. For many of the 30, 000 schoolchildren who visited last year, a large number of whom are immigrants or the children of immigrants, these stories legitimize and honor their own struggles and offer the comfort, which comes from knowing others have gone through this before. Many of the Museum's staff live in or have roots in the neighbor and many are migrants or immigrants who have come here from the Dominican Republic, Puerto Rico, Ukraine, Poland, Switzerland, Germany, Ireland and Canada. Through its Theatre program with the Immigrant Theatre Project, the Museum has brought business to playwrights and actors from Mexico, Jamaica, Columbia, Iran, Japan, Israel, Russia, Romania, Syria, India, Israel, Indonesia, Malaysia, Egypt, Armenia, Yugoslavia, Nigeria, Australia, Great Britain, Puerto Rico, and Trinidad. Time and time again, organizations working to make this community a better place have turned to the Museum to help orient, inspire, and educate the diverse publics they serve. In learning that area residents were waiting up to three years for free English for Other Speakers classes, the Museum partnered with University Settlement House to offer a free ESOL class that taught through the diaries and letters of immigrants past. Concerned that many neighborhood children were living in conditions that rivaled its own tenement building, the Tenement Museum partnered with the New York City Department of Housing and Preservation Development to develop Inspect This!, a program that teaches children the history of housing laws and how to report violations in their own homes. The Museum developed the Lower East Side Community Preservation Program with numerous community organizations such as St. Augustine's Church, the Chinese American Planning Council, and Eldridge Street Synagogue to build bridges between diverse elements of its local community through the common effort to preserve important historic sites in the neighborhood. Finally, realizing that the garment industry had been a source of both employment and despair for neighborhood residents for hundreds of years, the Museum has worked with Chinatown Manpower Association, Good Ole Lower East Side, and numerous other organizations to open an exhibit that will explore the industry, past and present. Due to the incredible significance of 97 Orchard Street to all of the aforementioned groups and people, the Lower East Side Tenement Museum and the public must safeguard this building, the only one of its kind in this country, for generations to come. While a New York Post article recently listed an individual, Lou Holtzman, as part owner of 99 Orchard Street, the current title for the building lists 98 Allen Realty Corporation as the owner; the deed for the building changed hands from Lou Holtzman to 98 Allen Realty in March of 2000. Further, records that were filed with the Department of Buildings have listed an employee of Sun Sun Corporation, a conglomerate that owns at least 10 businesses in New York, as the owner of 99 Orchard Street. Lou Holtzman's partnership with this corporation is not clear. Similarly, while Lou Holtzman claims that he and or his family lived in the building for a number of years, DOB records demonstrate that the building had been declared unoccupied of residential tenants since 1952. This means that if he did live there he did so illegally and he evaded housing construction and safety regulation in wiring, plumbing or construction of his home. According to DOB complaint records, Mr. Holtzman created a sound studio in the building without filing for a permit in 1993. It seems Ruth Abram is not a rocket scientist. I always owned 50% of my family building. I opened a corporation named after the alternate Allen St. address of my building after I found a partner who was good for me and the neighborhood. I converted my ownership to equal shares in my corporation. People do that in the year 2002. When my aunt and I owned it together it was a family building that had 2 equal owners. We had no need for a corporation in those days. Remember- EastSide Sound went in business in 1972. The DOB Complaint was from Jeff Bittner, younger brother of my studio partner from 1980- Richard Bittner. In 1993,Jeff was jealous of his brother and made all these complaints from the IRS to the building Dept. He committed suicide shortly after getting out of prison...... RUTH, Jeff had issues and he could not handle them. What is your problem?? 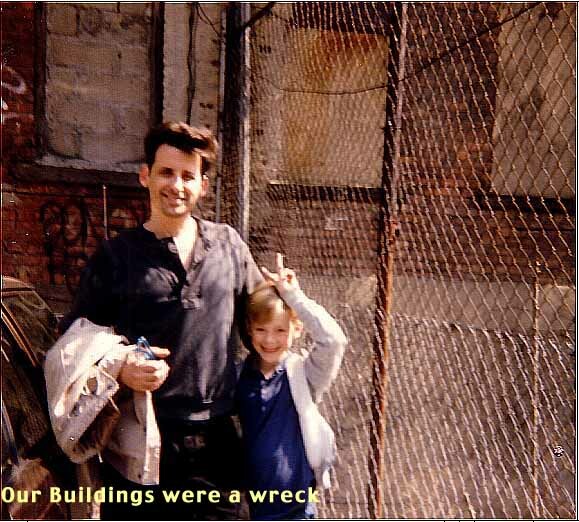 1993-illegal construction?? where were you for the last 21 years prior-your research is a sham. Declared vacant, a 3*5 inch index card with a hand written "Vacant" from 1952- She is desperate-Oh, and I am living illegally in my building back in the day. First of all I can live in MY BUILDING, second, no one came looking in my drug infested neighborhood. All building-fire-sanitation-police dept. knew Louie Holtzman, they knew I lived there, they knew I was armed and protecting mine and your future unkempt building. Protecting my infant son and wife...Ruth - You make my family sick. All this speculation. Ruth does not mention that she ran a museum flaunting every fire code in NYC. Her museum was overlooked because of powerful family , legal and political allies. I know this as a fact since I was there for opening day. A mere mortal would have been in deep trouble for bringing people into the fire trap known at the Tenement Museum before the sprinklers came. Ask her when she opened and when the sprinklers came. It was 1970 and I was cleaning out my deceased Grandpa's junk emporium on the upper floors-what filth I would clean-dumpster after dumpster-I loved it. I was putting life into my homestead. One day the fire dept. shows up unannounced. The troops are climbing through my life looking at my pitiful situation. When it was at its end the Captain comes up to me and screams square in my face-I want this place clean in 24 hours... He then bursts out laughing and smacks me on the back and says good luck, everyone leaves...Can a Ruth Abram even understand what I just said here? The museum is a fairy tale, now it is a fairy tale that insults me-my family-my efforts in life--the Lower Eastside Spirit. A special note:My Mom passed away 9/7/01 and we all miss her. She lived her life in this building until she was 20 years old. My favorite moment was when she called Ruth and gave her a verbal whipping over the phone. My mother told her she was like a wild dog after a piece of meat and to leave her son alone.I did not witness this call and I must say for "HISTORIC" value that a true urban pioneer and tenement dweller did not think much of Ruth the invader. In fighting for the security of it's building, the Lower East Side Tenement Museum appealed to its contacts at the city, state and federal level. After fourteen months, and after four stop work orders were levied on 99 Orchard Street, ESDC stepped in and decided to proceed with condemnation of 99 Orchard Street for the benefit of the public good. When the condemnation procedure is complete, ESDC will purchase 99 Orchard Street from the owners at fair market value price, as determined by an independent appraiser. The 15 residential tenants of the building, the first of whom who moved 130 days ago, will be compensated for their apartment search and move. The Tenement Museum is very sorry that 15 people must suffer the temporary inconvenience of finding new quarters. However, as these tenants are paying $1650 a month for 325 square foot apartments, almost $20, 000 a year, there are certain to be comparable apartments on the market that they can afford. The addition to the restaurant that opened in December will have to close. However, the owners Sun Sun Corporation will still have the original portion of their restaurant next door at 101 Orchard Street and will be compensated for the sale of the building. Can you handle such incredible arrogance.. Just imagine this was your home, your life. All this for the Tenement Museum?? In order to secure the future safety of the Museum's landmark tenement building, ESDC will then sell 99 Orchard Street to the Museum. The Tenement Museum will use 99 Orchard Street to expand its programming, especially for children, families, and visitors with special needs. With the acquisition of 99 Orchard Street, we will be able to provide fully handicap accessible spaces and exhibits. We will open new apartments, bringing the story of immigration to our area up to date. We will have exhibition galleries and public art installations that showcase the work of contemporary and historic immigrant artists. And we will have meeting and conference rooms our community partners can use for collaborative programming. While the Museum is a private non profit, it became an affiliated site of the National Park Service in 1998- partnered with Ellis Island and the Statue of Liberty- and with this expansion it can expect to accommodate a portion of the 5 million annual visitors to both of those sites. With the acquisition of 99 Orchard Street the Museum will be able to serve more than 200, 000 visitors who will shop and eat in the small shops and restaurants of the area that dot the Lower East Side, Chinatown, and Little Italy - so many of them owned by immigrants. While the Museum currently has as staff of 100 full-time, part-time employees and interns, many of who are immigrants or from the neighborhood, the expansion will create at least 100 additional jobs. In a neighborhood where at least 1/3 of the residents are on some form of public assistance, these larger economic benefits to the neighborhood are crucial. Millions of native-born Americans and contemporary immigrants trace their beginnings in this country to homesteads such as the Museum's landmark tenement building, yet is the only site of its kind to be preserved and interpreted in America. The damage that was wrought on 97 Orchard Street caused great concern about the future of this very unique national treasure, as did the unlawful and unscrupulous actions of 99 Orchard Street's owners. We are most grateful to ESDC for initiating this plan to secure 97 Orchard Street for the benefit of the neighborhood and tens of thousands of school children and tourists for years to come. The stories and legacy of 97 Orchard Street has provided a great many people of all walks of life with a sense of rooted ness, hope, and inspiration. In the aftermath of September 11th, Americans need such a place of comfort more than ever. My family has lived and worked at 99 Orchard St. for 4 generations. I recently closed my recording studio of 32 years to complete a total renovation of my property. My building is finished and occupied, it now has 14 tenants plus my wife and I being the 15th. It has been called a state of the art project. The restaurant, already deemed one of New York's great Chinese cuisine establishments has been expanded into a beautiful dining facility. Needless to say my building and the Lower East Side have been my family's life. This building is a show piece for future development on the lower East Side. It is a combination of old and new immigrants living and working together to create jobs and residences for the community. Now, without a hint until there appeared a notice in the Daily News, the State wants to acquire my building for the museum using the laws of Eminent Domain. For the last few years, Ruth Abram of the Tenement Museum at 97 Orchard St. has been on a campaign to acquire my property. 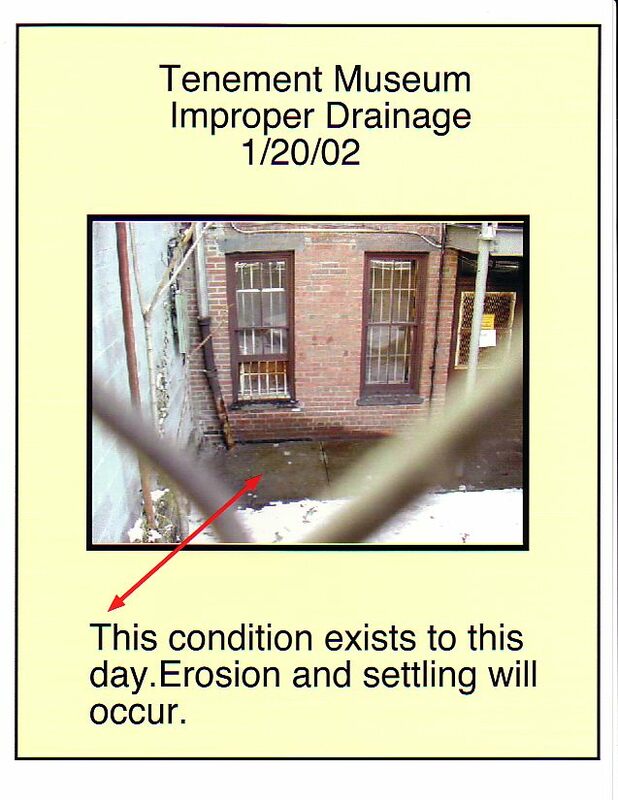 Prior to commencing my project, we entertained good faith negotiations with the museum, however, their purchase offer did not match the offer from our neighbor at 101 Orchard St.
Ms. Abram put our construction under a microscope with needless complaints to the building dept. stating that my construction was destroying her museum. Each and every alleged complaint was summarily dismissed. Claims of "undermined rear walls" were unfounded; "dropped walls" and "cracks" existed since we noticed them in the 1960's; "rear wall bulge" existed since we noticed it in the 1960's. 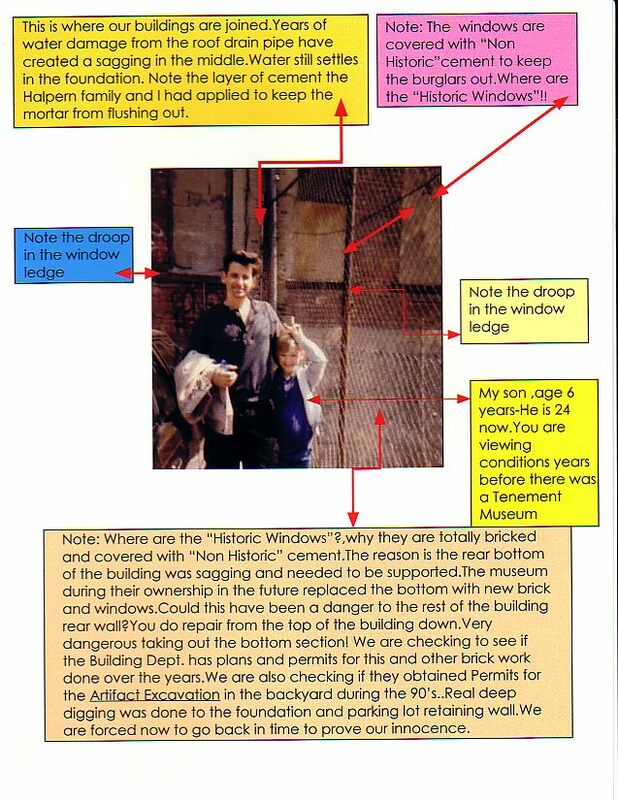 In the late 1980's the museum replaced their rear brick lower level facade without proper drainage; the windows and doors were warped and out of alignment in both our buildings since I was a little boy; The NYC Buildings Department was more alarmed by the filing of innocuous complaints and the fact that the museum used them for their own purposes then for anything else. I have been here all my life and I can tell you that disrepair of both our buildings were apparent well before Ruth arrived. Dr. Halpern, who owned 97 Orchard, knew the shape of our old buildings. Ruth and her so called professionals went on a rampage. The documentation from various agencies I have acquired borders on the absurd. They successfully closed my site for accumulated periods of many months based upon false claims which were all eventually dismissed. I lost precious time and resources. Endless complaints and delays continued. The paper trail of their campaign now leads to a Public hearing on January 9, 2002 - 6-8 pm at the University Settlement House auditorium - 84 Eldridge Street. Amazingly, we have little time to put together a defense to all this due to notice given to us during the peak of the Holiday Season!! The museum has 2 upper floors that are not being utilized - the museum has a large lower floor that is not being properly utilized. I understand they want to expand but they have to face reality. The museum cannot be allowed to grow by destroying my family's life and commitment to NYC. They wax over the ghost's of past tenement dwellers and their struggles, but never mention my family which has lived and run our family business on Orchard St. since the early 1910's. It is such an insult to my family. I brought EastSide sound studio to this neighborhood when the lower East side was drug infested, neglected and undesirable. I helped bring world class musicians and artists and life to a dying neighborhood. I've had many close calls to losing my life. The new immigrants of the lower East Side became partners with one of the old immigrants to bring my building and my neighborhood back to life. I wonder if Ruth Abram is next looking to displace you out of your homes, businesses, and properties!!! In light of 9/11, it should not be the focus of our institutions, both public and private, to relegate their resources towards loss of jobs, families, and tax revenues from a growing neighborhood which, until only recently, has turned a corner toward prosperity and security for its residents. We need your help and are grateful for your support. Re: N. Y. S. eminent domain takeover of 99 Orchard St.
"N. Y. C. has a $4 billion hole expected in next year's budget.